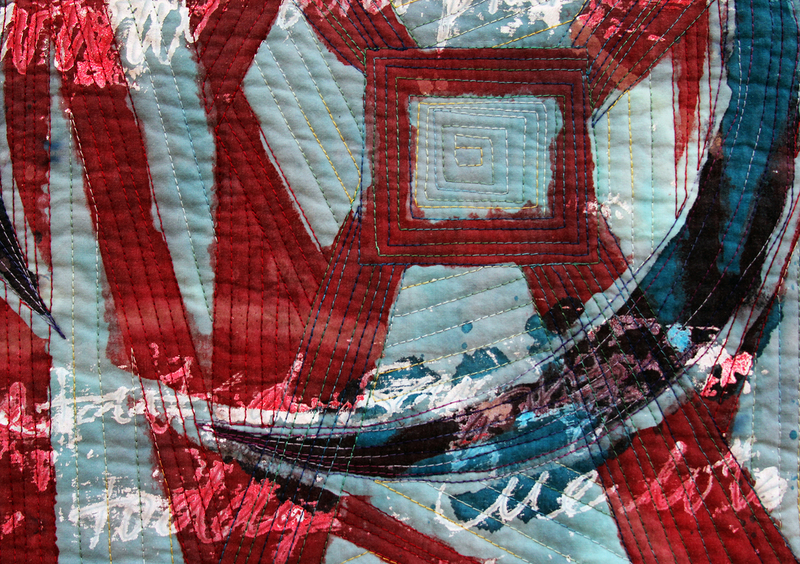 I am delighted to be teaching somewhere close to home for the Utah Quilt Guild Quilt Camp this fall. 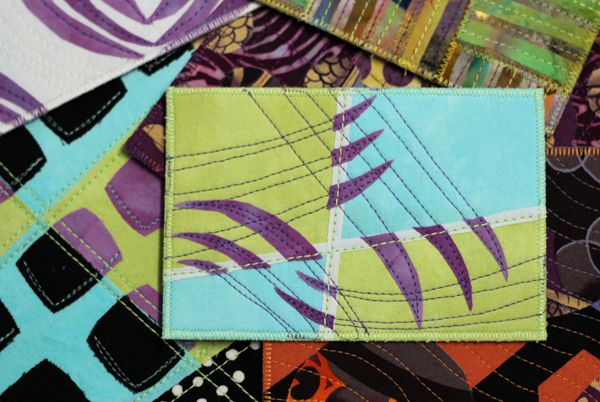 Their Quilt Fest will be held September 15-19, 2015 in Layton, Utah. The brochure with the complete catalogue and class descriptions is located here. Registration begins June 1, 2015 for classes at the Davis Conference Center, a fantastic venue! 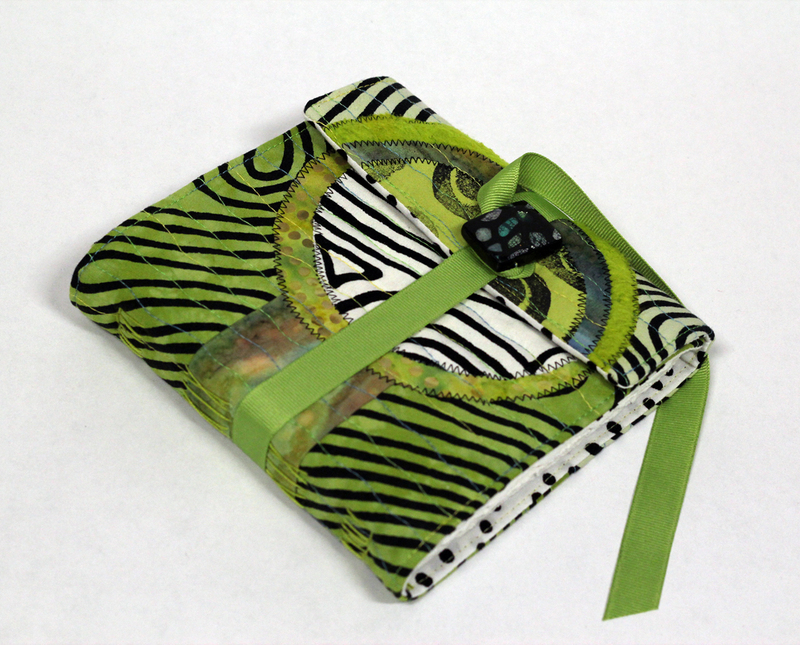 I’ll be providing my Designing and Organizing your Quilting Space lecture and teaching an all day workshop, Quilted Journal. 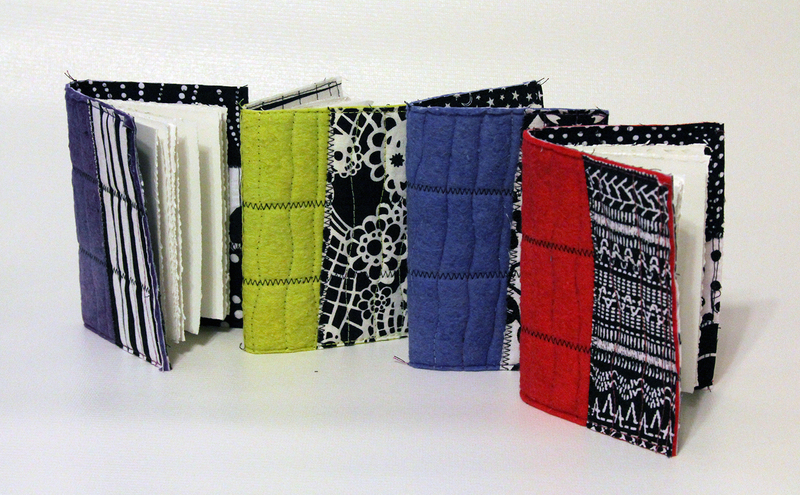 Here are some images of projects from my Quilted Journal class. 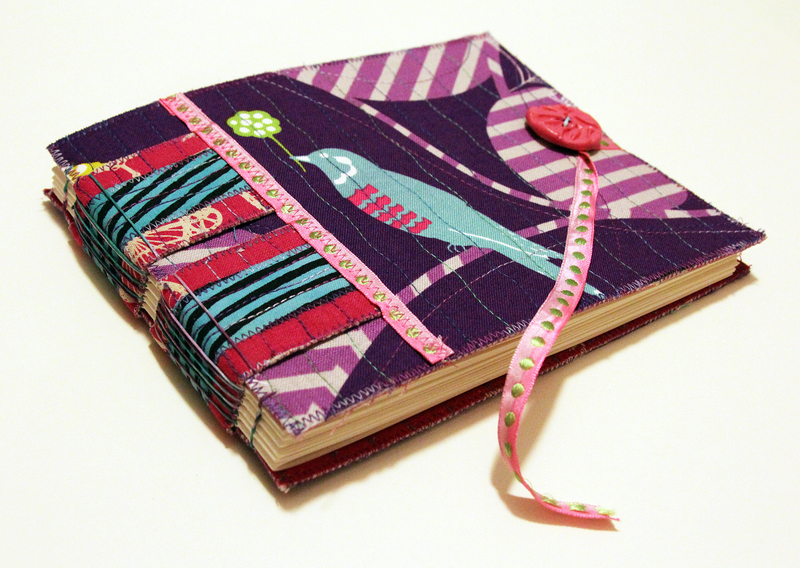 Create your own distinctive textile journal or sketchbook! 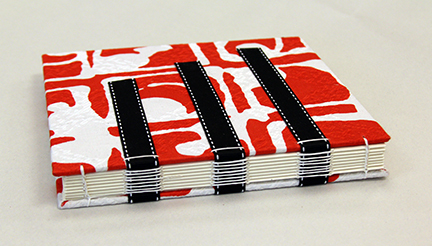 The class will focus on mastering a sewn tape binding technique with a wide range of uses and implications. 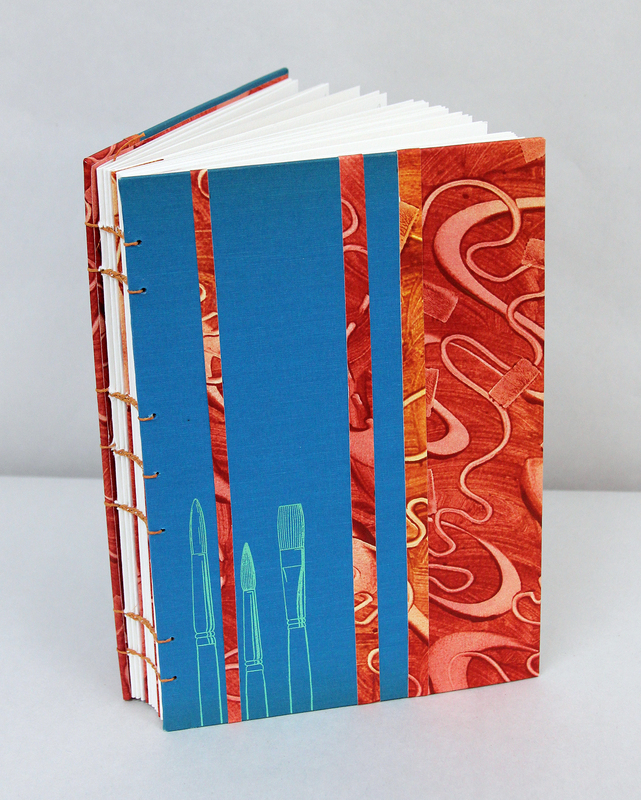 Learn the basics of handmade bookmaking techniques while crafting a beautiful machine quilted journal. 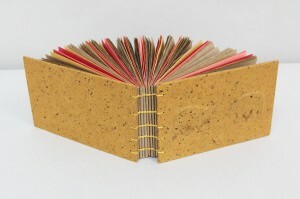 Take this unique bookmaking project with you to document your next travel adventure! 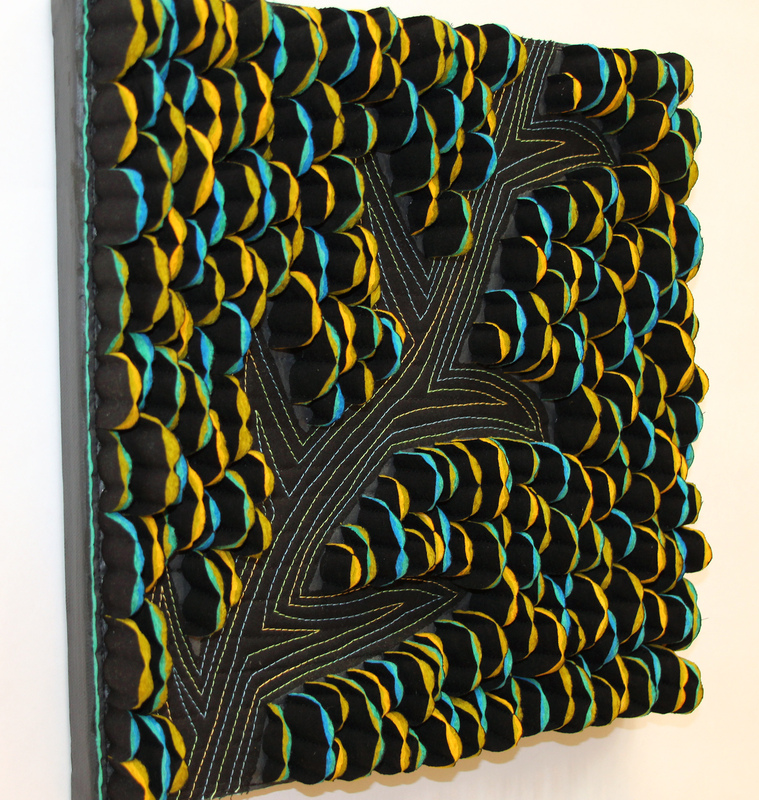 The Appalachian Center for Craft 2014 Workshop Instructor Exhibition is open! Stop by the beautiful campus near Smithville, Tennessee and have a bite in the cafe, take a hike, and see all of the amazing artwork. The exhibition runs through July 13, 2014. 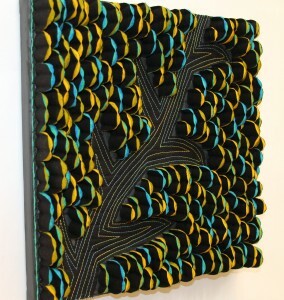 For this exhibition, I created a new triptych: Botanique I, II and III. 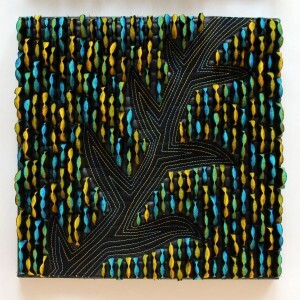 Each piece is mounted to a 12″x12″x1/2″ stretched canvas. I created these pieces this spring as an Idaho winter was slowly ending. I love the bright greens of spring! Detail view. 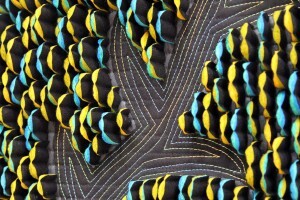 Stitching with variegated thread. Botanique II. 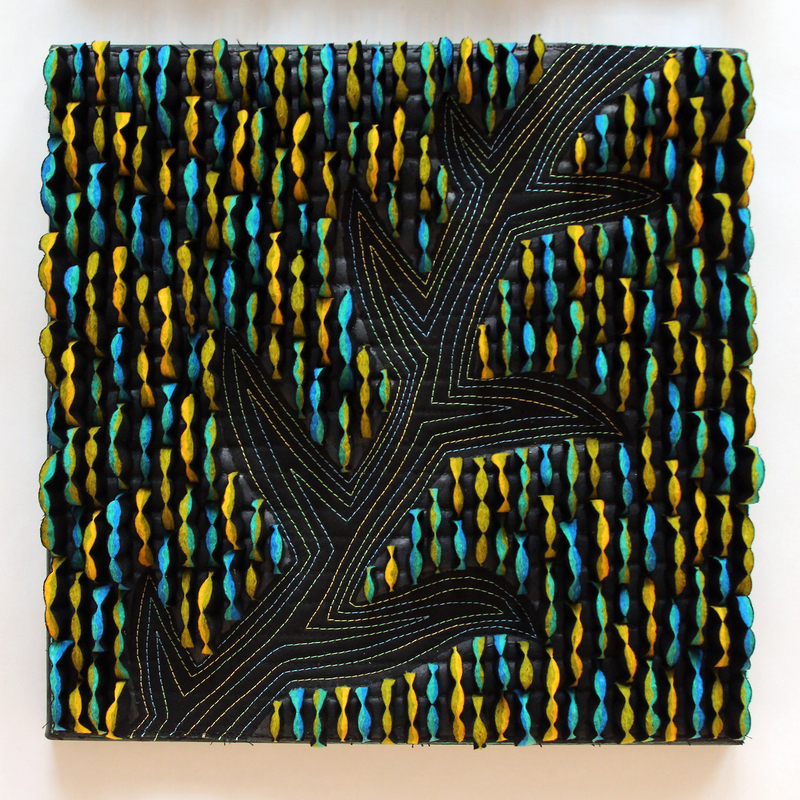 Created with quilts consisting of two layers of artist hand dyed batting, machine stitched between layers of black Kona cotton fabric. Botanique I, II and III as a triptych. They can be displayed either vertically or horizontally. Botanique I. 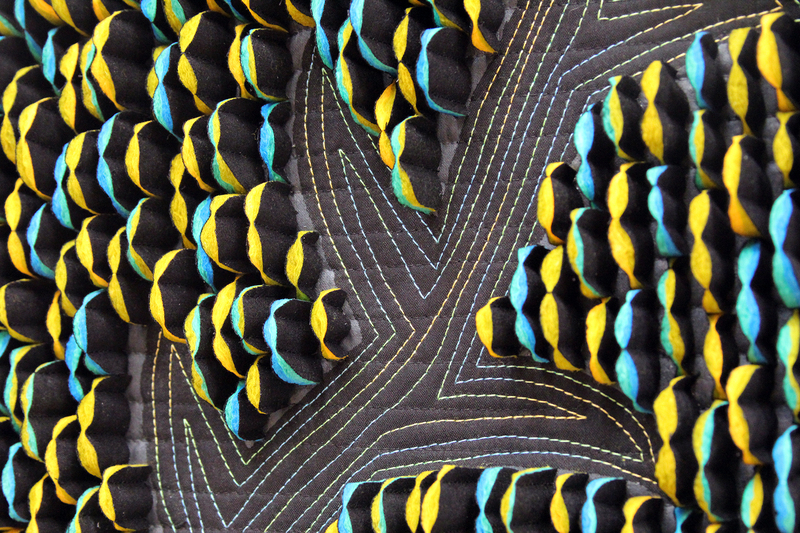 Here you can see the edge detail of the painted canvas and the depth of the quilt pieces extending from the surface of the back quilt. 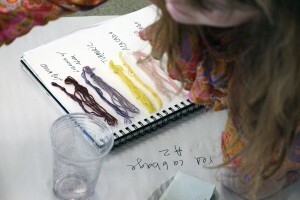 Join me for a workshop this July at the Appalachian Center for Craft in Smithville, TN. 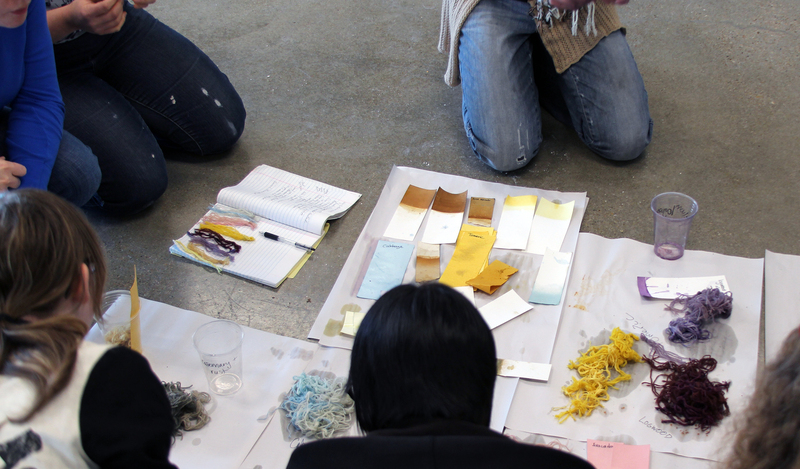 The workshop is Dye It, Resist It, Rust It! 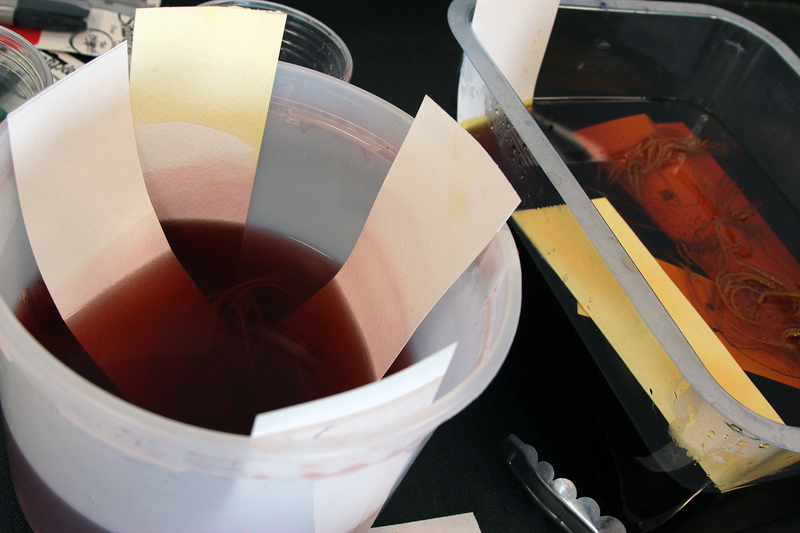 to cloth with resists, rust effects, textile paints and dye. 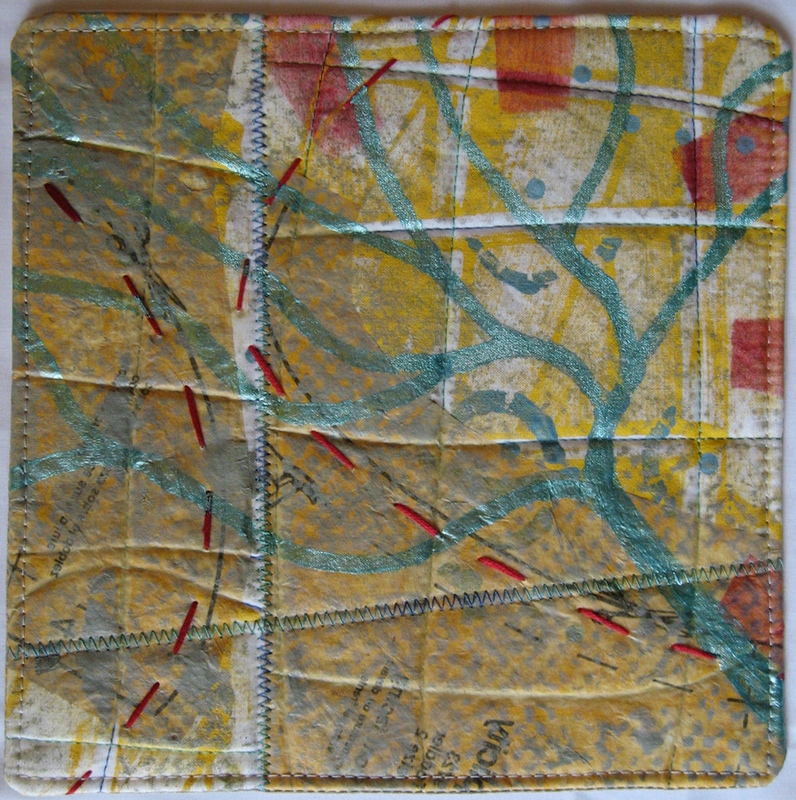 Investigate many surface design avenues including: imagery transfer methods, hand created stamps and stencils, sun prints, and found objects used to alter the textile surface. Textiles created in this class can be used in a multitude of ways including art cloth, art quilts, fashion, sewing and book projects. The facility is truly a beautiful retreat setting. I got to visit this last fall and take a tour of the studios and facilities. Just amazing! We will have an incredible and messy week! For more information, please contact me at killerbeedesigns@gmail.com or the Appalachian Center for Craft, Tennessee Tech University at (931) 372-3051. I visited the College of Western Idaho Art Club in Nampa, ID this month to provide a Natural Plant Dye Workshop. Here are some images of the excited and wonderful students. 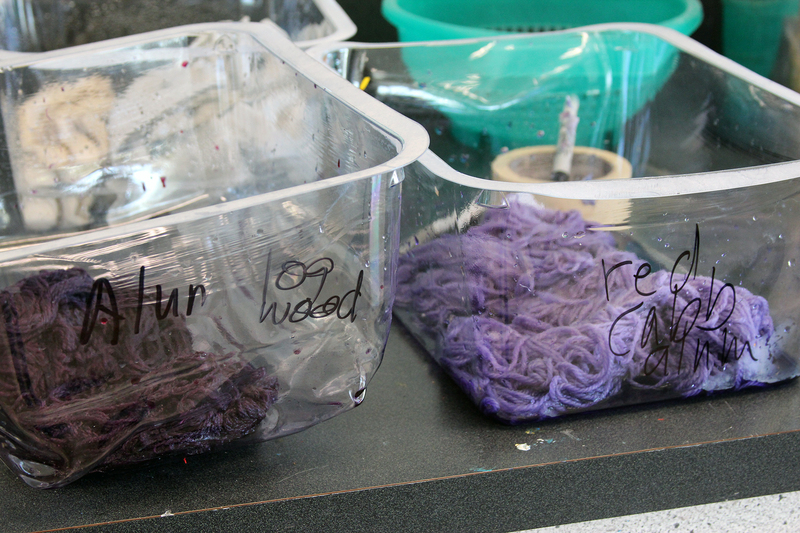 We had some logwood sawdust to play with, which made some lovely shades of violet. A local restaurant saved us some avocado pits so we could get that luscious pink. Everyone went home with some samples and (hopefully) ideas. Thank you to the wonderful professors and students at CWI for a really successful trip! 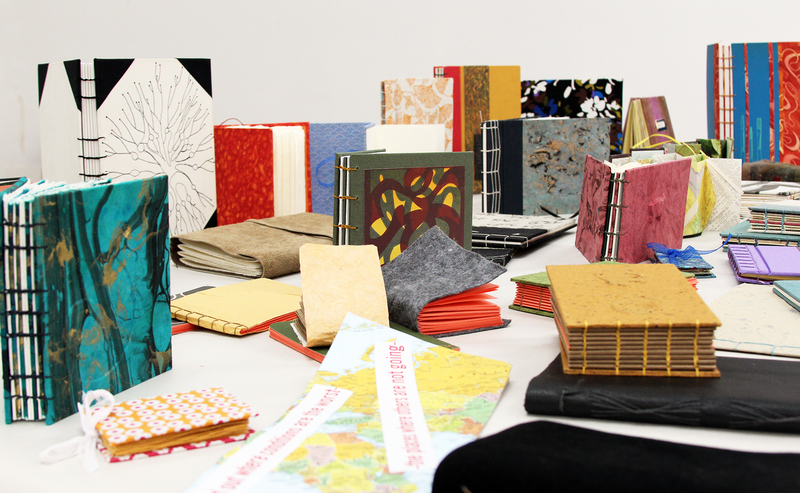 I had an amazing, creative and impressively productive group of students for my Adventures in Bookmaking workshop last month at Arrowmont School of Crafts in Tennessee. I planned to cover a number of bindings, but I had hungry students and we added about 4 more to the list! 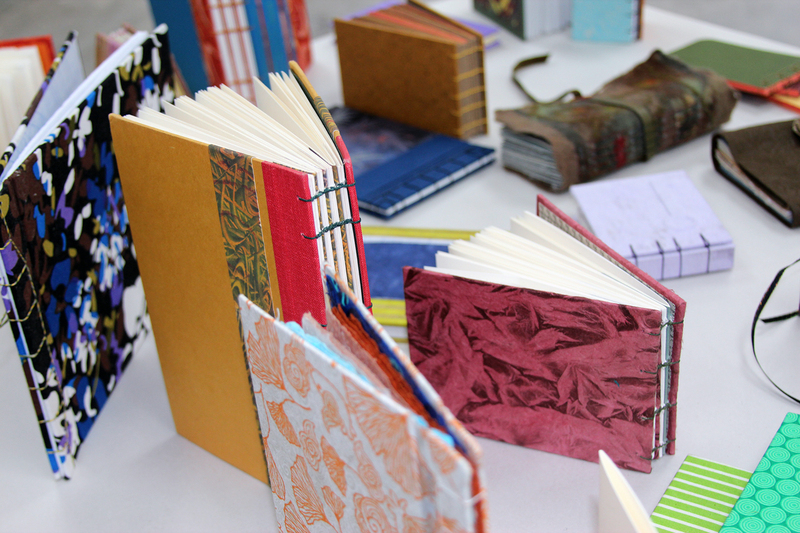 Bookmaking fiends. 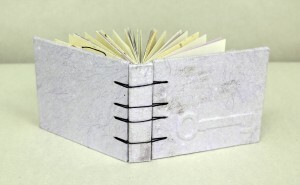 Because these 7 women had super powerful arms, a number of awls and needles were sacrificed in the name of bookmaking. For even more images, check this flickr set. Jessica’s Coptic Accordion Binding with a cover flap to allow it to stay closed. You can’t have a week at Arrowmont without a bear-themed item! Students raised and lowered the surface of their covers utilizing layers of Davey Board. 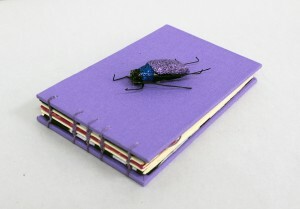 Please note that I did not steal Season’s book. Look at all of these books! Fabric and paper covers. Sparkly Roach Coptic, my personal favorite. Elegant Japanese Stabs with Hard Covers, utilizing book cloth. Some students wanted to try an upcycled or reconstructed Coptic (like the ones I have in the Arrowmont Instructor Exhibition this year.) So, they raided the “for sale” rack in the library and came up with beauties. 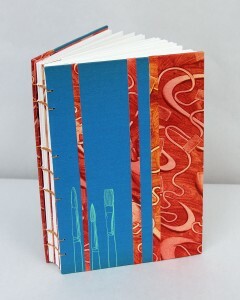 The paintbrush imagery was on the cover of the original book and Judy added her handmade paste papers to the cover. I bet you wish you were there. And lastly, a stack of book boards cut and ready to use at home. What an astounding week. Great things were happening in all of the diverse classes all over the campus. 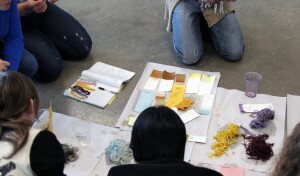 We had wonderful studio assistants, work-study students, and the staff were supportive and great (as always). Be sure to get to Arrowmont and meet this year’s wonderful resident artists. 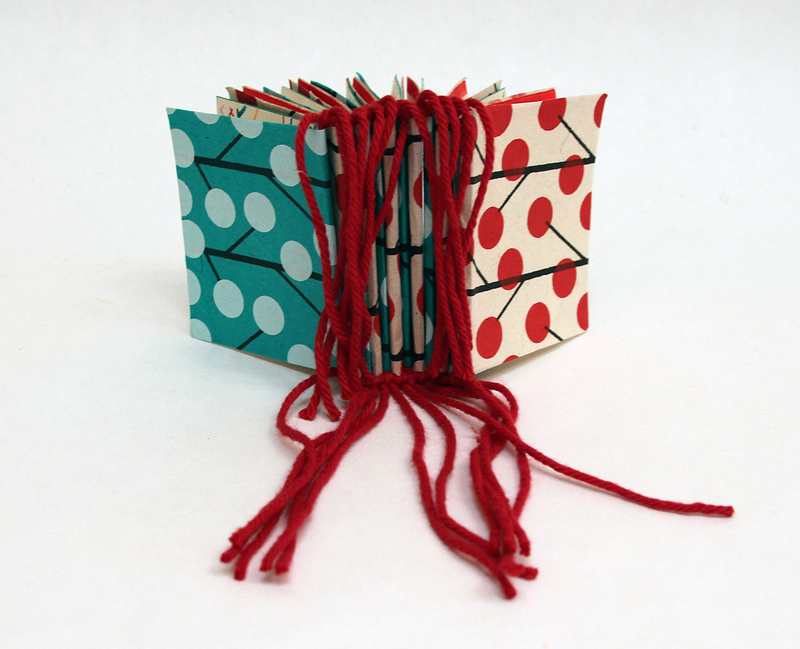 Dive into the world of creating your own unique textile artists’ books and sketchbooks. The class will cover the foundations of bookmaking, with opportunities for advanced exploration of new techniques for more experienced students. Special emphasis will be placed on special methods and ideas for using textiles to create unique handmade books. 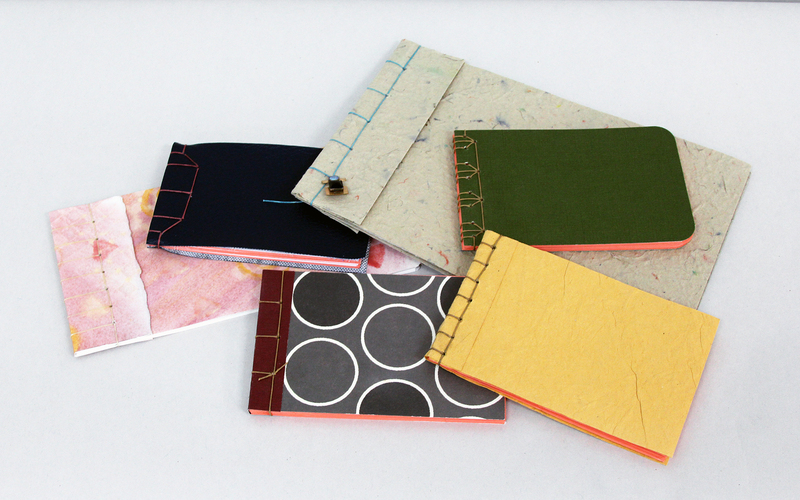 Learn the technical skills through the creation of blank sample books. Investigate the use of sewn bindings, including the Coptic Stitch, Medieval Long Stitch, and a tape binding. There are still spots left in the workshop, so sign up and tell your friends today! I worked on a few books this weekend and thought I’d post some images. 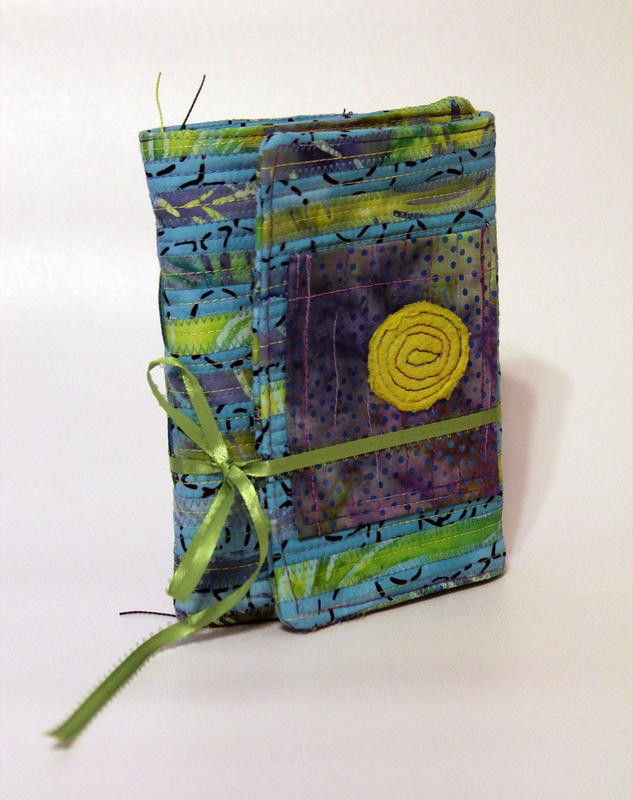 The book above has a quilted cover that uses a scrap of some great mixed media fabric I made several years ago in a workshop with Judy Coates Perez. She’s amazing. 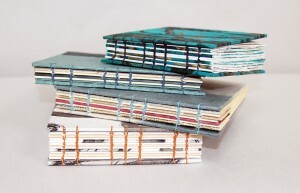 I layered some batiks on top and included some watercolor paper for the interior pages. 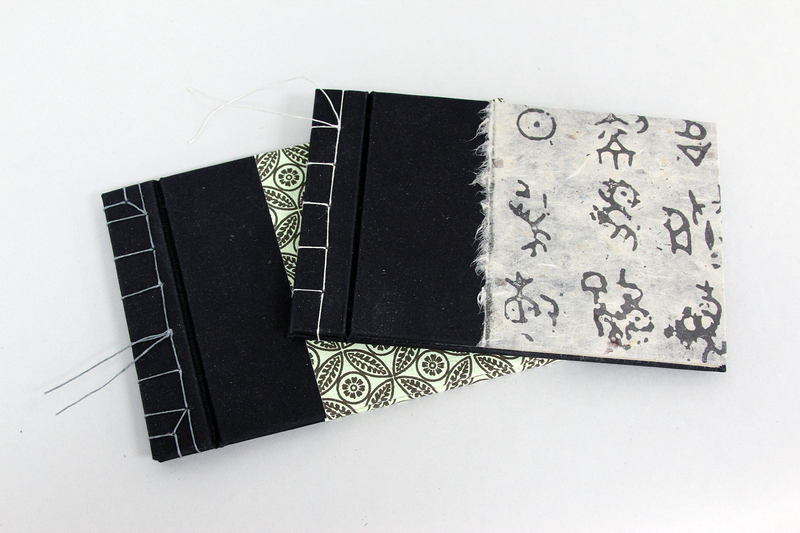 To make these 4 miniature books (4 1/2″ x 3 1/2″), I use some of my dyed batting and black and white cotton scraps for the covers. I used interfacing in the middle to increase the stability. For the book construction, I just used a stitch length of 5 and sewed right down the signature with my machine! This last book is for my upcoming niece’s birthday. She’s still a kindergartener, so I hope I can post without her finding the images. She is such a great kid. I always go home finding little piece of art or secrets tucked in my bag somewhere. 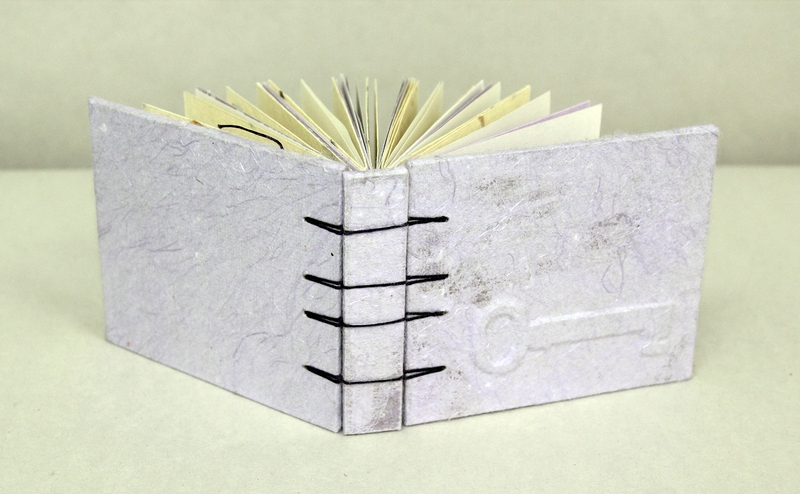 I thought I’d make her a sketchbook/journal with lots of hiding places. 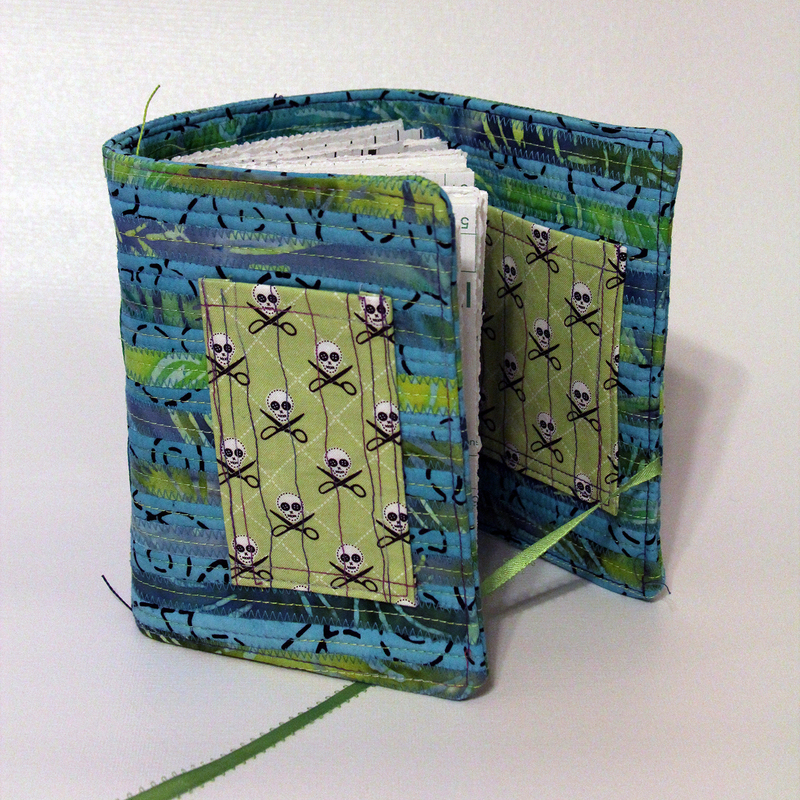 I had to include a little bit of skull fabric so she’d know it was made by me! My sister found this fun skull fabric for me. 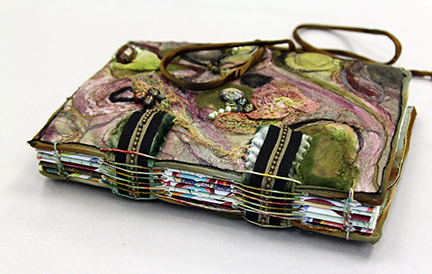 The signatures are stitched in with a medieval long stitch binding using some hand dyed perle cotton thread from Laura Wasilowski. 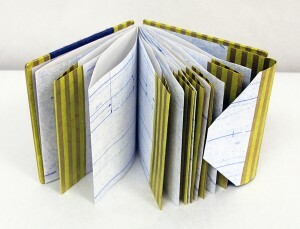 This last image shows a detail of some of the pages. 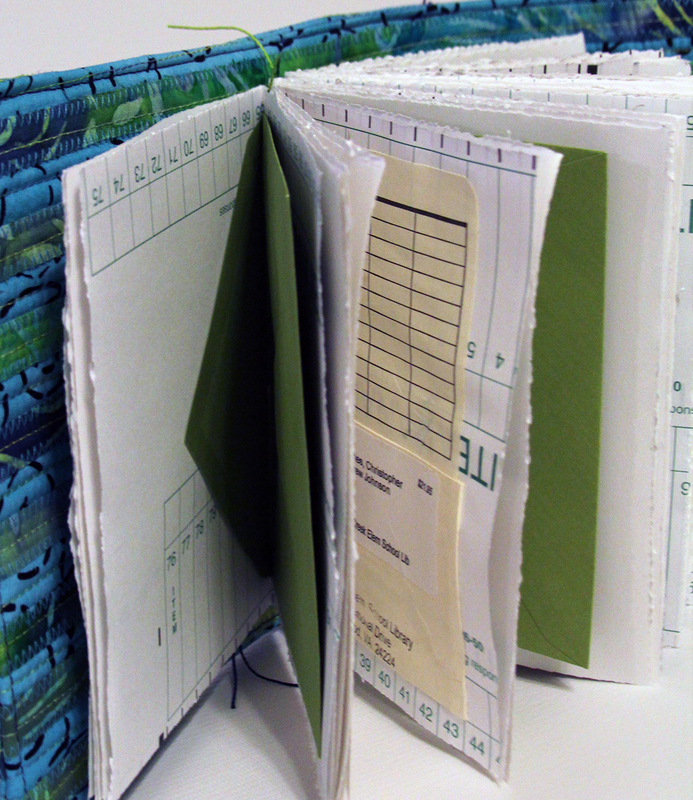 I sewed in some envelopes and library book pockets so that she will have more places to hide her treasures. 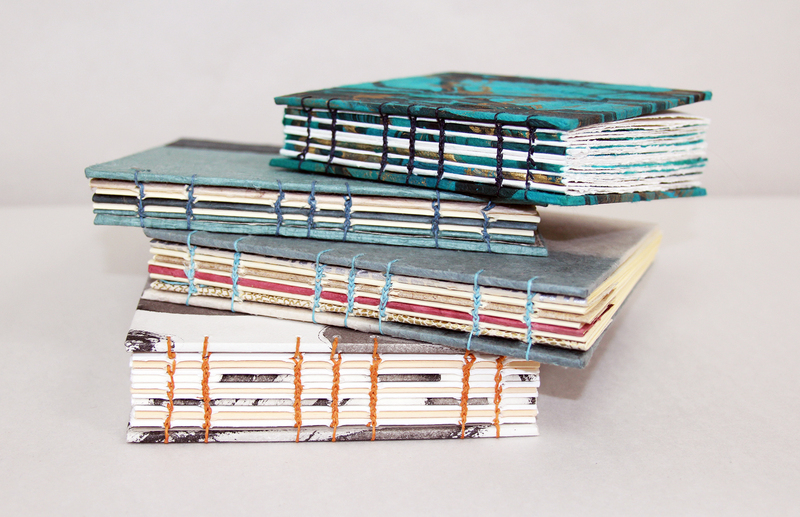 I will be teaching a textile bookmaking class for the 2013 Surface Design Association in San Antonio, Texas. Registration opens this week. See you there! 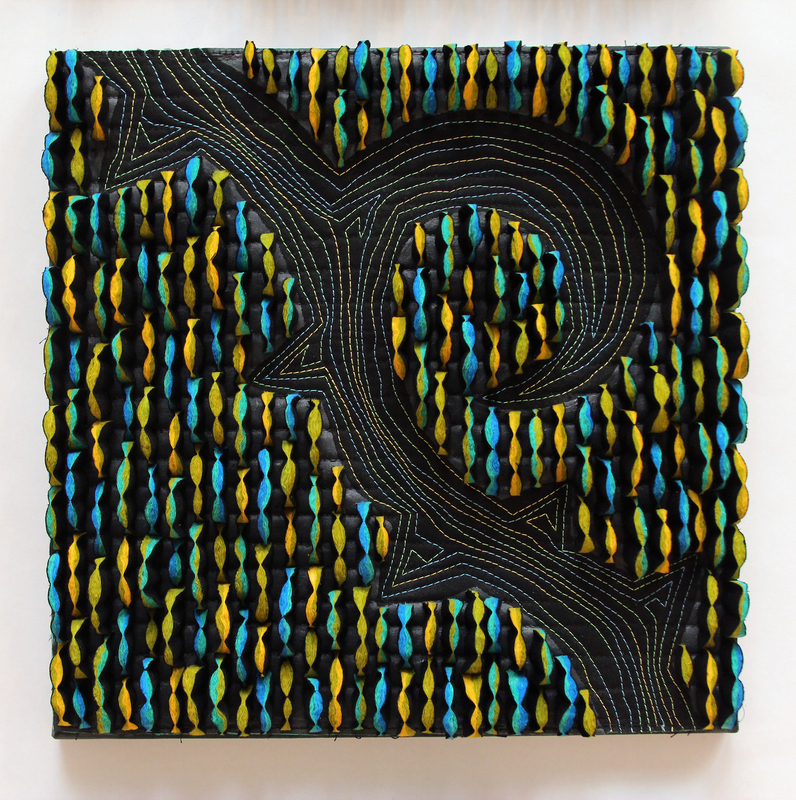 We had a great time at my Surface Design Exploration workshop last Saturday for the Quilter’s Guild of Dallas! 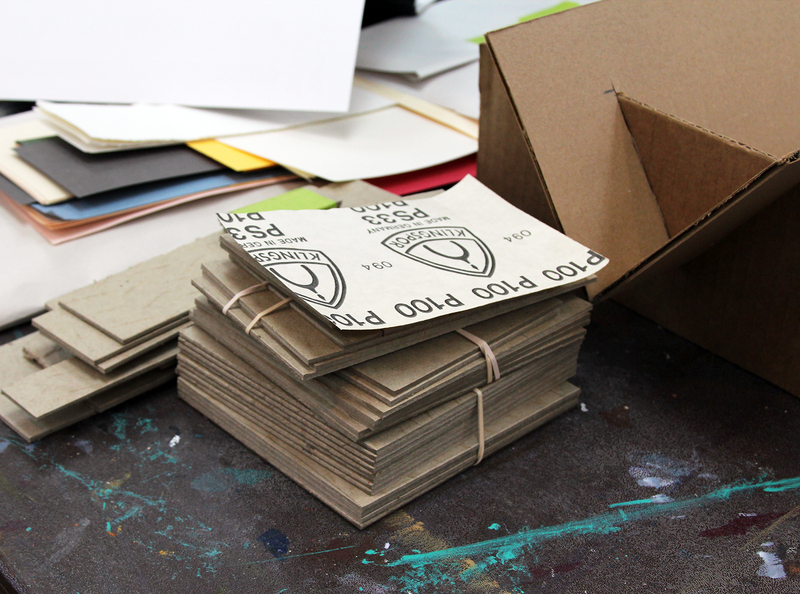 We painted, stamped, transferred, carved and glued all day. We made a lot of white fabric a lot more interesting! Just sharing a few photos of our great group of students. 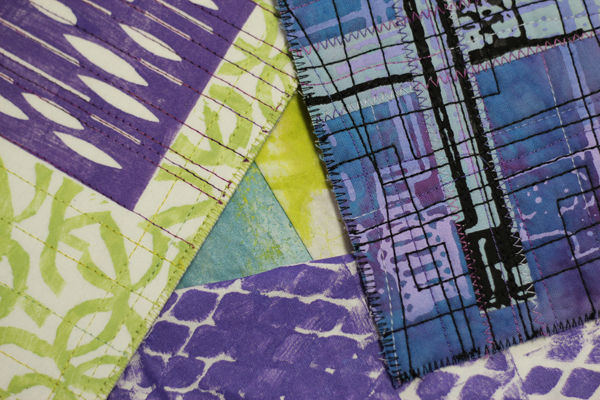 I full expect to see fabric created in this workshop as ACEO’s, Priority: Alzheimer’s Quilts, or Mini quilts for the Quilter’s Guild of Dallas auction! I’ll leave you with a tiny self portrait of myself as Dr. Horrible, ala Dr. Horrible’s Sing-a-long-blog. It is almost Halloween, you know. My sister of Puking Pastilles, has a free Dr. Horrible embroidery pattern sheet! I transferred her “goggles” image onto my digital print of a self portrait in fuschia. I used the CitraSOLV transfer technique that we did in class last Saturday. Super easy and fun! Even long distance we can collaborate. Don’t miss out! 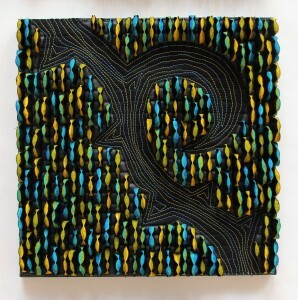 We have 9 spots left in the workshop I am providing for the Quilter’s Guild of Dallas on 10/9/10. We will be exploring all sorts of surface design techniques. 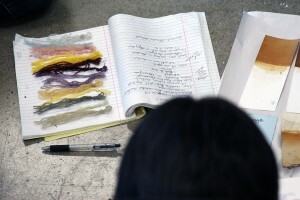 Explore textiles and printmaking in this exciting and dynamic class. Explore many avenues including purchased stamps and stencils, found objects, transfers, and hand-created tools to alter the textile surface. 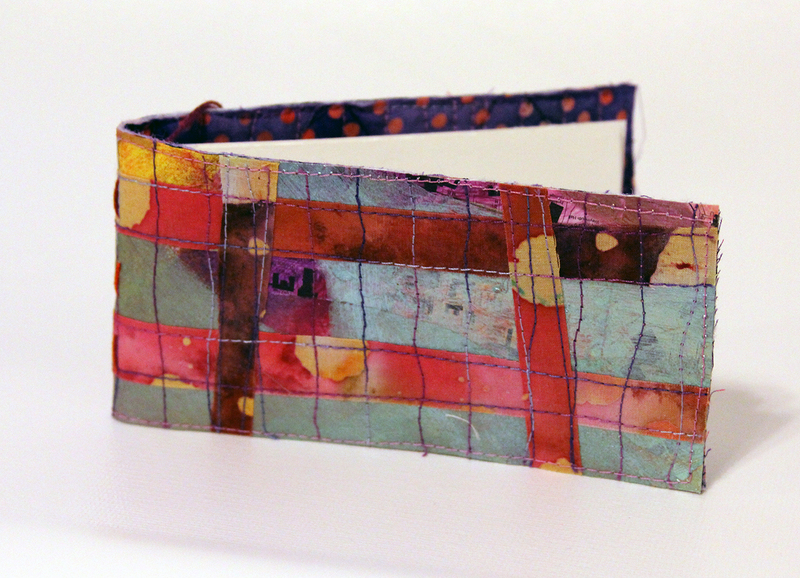 You will learn how to add pattern to cloth with resists, rust, dye, and textile paints. We will have a good combination of your own explorations of techniques and some things that I will demo only due to chemicals/messes/time constraints in a workshop environment. Contace the guild at workshops@quiltersguildofdallas.org or myself at killerbeedesigns@gmail.com for more information.